World Health Worker Week is an opportunity to mobilize communities, partners, and policymakers in support of health workers in your community and around the world. It's a time to celebrate the amazing work that they do and raise awareness to the challenges they face every day. Perhaps most importantly, it's an opportunity to fill in the gaps in the health workforce by calling those in power to ensure that health workers have the training, supplies and support they need to do their jobs effectively. Our 2019 theme is "Health Workers Are the Heart of Health For All." 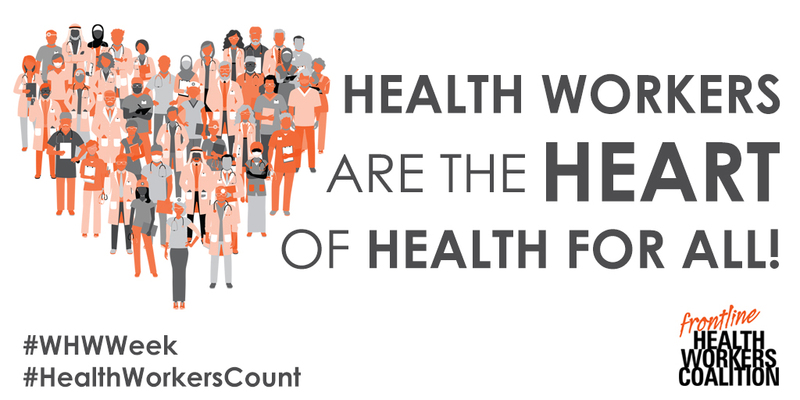 Find out how we're celebtrating below and read more about why health workers count! Help honor health workers all around the world all week long! Add your voice to the #WHWWeek conversation on social media! See our social media guide with our key themes and suggested tweets. 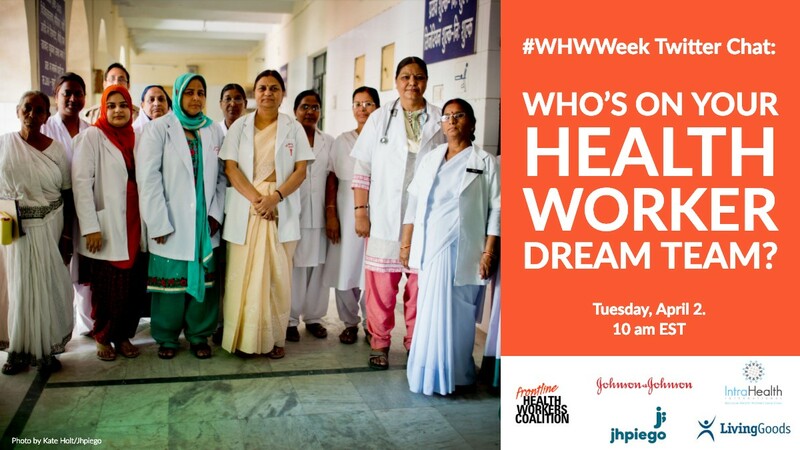 Join the #WHWW Twitter Chat on Tuesday, April 2, at 10 am ET, hosted by us and our members IntraHealth International, Jhpiego, Johnson and Johnson, and Living Goods. See our social media guide for the chat questions! Participate in our "Thank You, Health Hero" campaign on Instagram and Twitter. Choose a thank you note template, and dedicate one to a special health worker in your life. Then share it using using the hashtags #WHWWeek and tagging @FHWCoalition. We'll read the best thank you notes during our Hill reception (see below). Take part in our video testimonial series and tell policymakers in the US and around the world why health workers are the heart of health for all. Together with our member Chemonics International, and through the USAID-funded HRH2030 Program, we're gathering a wide range of short testimonials—from frontline health workers to global health leaders—about why health workers count for ensuring every community has access to essential health services. It's easy to take part! Read our guidance and submit. 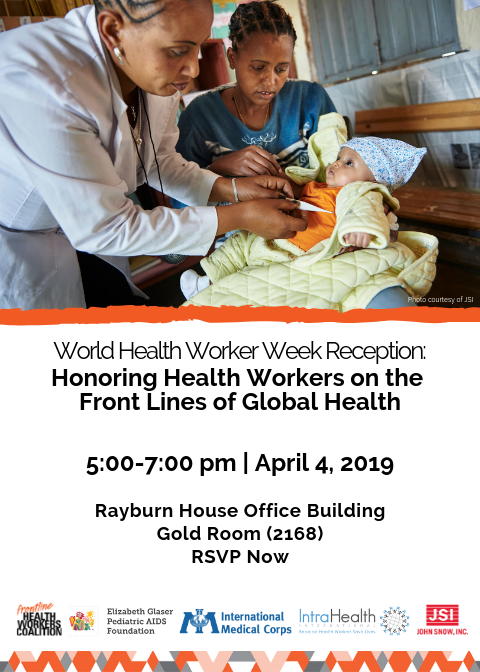 We'll share testimonials throughout World Health Worker Week and show the best ones at our Hill reception (see below!). If you're in Washington, DC, please come to our Congressional Hill reception on April 4 from 5 - 7 pm! Cosponsored with our members the Elizabeth Glaser Pediatric AIDS Foundation, International Medical Corps, IntraHealth International, and JSI, this event will focus on honoring the contributions of frontline health workers around the world and the essential nature of their work to achieve progress on US global health priorities. We'll educate Congressional representatives on frontline health workforce issues around the world and amplify the voices of frontline health workers in the political sphere. RSVP today! Organize your own events, local advocacy campaigns, and other activities calling global leaders to prioritize health workforce strengthening. Share them using #WHWWeek. World Health Worker Week is only seven days, but you can take action and make a difference year round. Follow us on Twitter and Facebook to get updates of our activities, news and ways to get involved. They are caretakers. They are educators. They are your neighbors, friends, and family. Without them, there would be no health services for millions of families worldwide. Frontline health workers are midwives, community health workers, pharmacists, peer counselors, nurses and doctors working at community level as the first point of care for communities. They are the backbone of effective health systems and often come from the very communities they serve. They are the first and often the only link to health care for millions of people. Frontline health workers provide immunizations and treat common infections. They are on the frontlines of battling deadly diseases diseases like Ebola and HIV/AIDS, and many families rely on them as trusted sources of information for preventing, treating and managing a variety of leading killers including diarrhea, pneumonia, malaria and tuberculosis.